Concrete contraction joints are intended to create weakened planes in the concrete and to help regulate where cracks will occur. 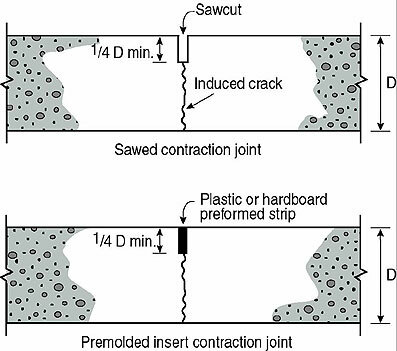 Simply, contraction joints are pre-planned cracks made by saw cutting or tooling a joint in the concrete. Cracks in concrete cannot be prevented entirely, but they can be controlled or minimized by properly designed contraction joints. 1. Concrete is weak in tension - When its natural tendency to shrink is restrained, tensile stresses that exceed its tensile strength can develop, resulting in cracking. 2. In its early stages, before concrete dries out, most cracking is caused by temperature changes or by the slight contraction that takes place as the concrete sets and hardens. Later, as the concrete dries, it will shrink further and either additional cracks will form or preexisting cracks will become wider. Contraction joints provide relief from tensile stresses, are nicer to look at and are easier to maintain. Here we are using an early entry Soff-Cut saw to install contraction joints in a concrete slab. If uncontrolled cracking of concrete flatwork is to be avoided, contraction joints must be carefully designed and properly constructed. 1. The maximum joint spacing should be 24 - 36 times the width of the slab. In a 4" thick slab the joint spacing should be 10 feet. It's also recommended that joint spacing be limited to a maximum of 15 feet. 2. All panels should be as square as possible with no panel having a length exceeding 1.5 times the width. 3. Avoid any L-shaped panels. 4. Contraction joint depth, either grooving or sawing, should have a minimum depth of 1/4 the slab thickness and never less than 1 inch if possible. 1. Early entry dry cut saw joints are typically done 1 to 4 hours after the slab finishing process. 2. Conventional saw cutting is generally done 4 to 12 hours after slab finishing has been completed. 3. Tooled joints are done early in the finishing process and rerun later to insure proper depth has been achieved. 4. Preformed plastic or hard board strips are inserted into the concrete surface to the required depth during the pouring process or early on in the finishing process. Tip: Contraction joints in industrial and commercial floors subject to heavy traffic require special attention to prevent spalling of joint edges. These joints should be filled with a joint filler material capable of supporting the joint edges. 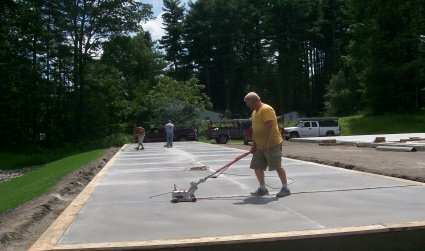 By pre-planning the method, exact location, and the timing of installing contraction joints, you will greatly reduce the chance of random cracking in your concrete slab. To help further reduce cracking in concrete read about concrete expansion joints and concrete construction joints.